Today, the 29th January was supposed to be moving day. It was moving day in everyone's mind, that is apart from our buyer's solicitor who threw a spanner in the works late last week, demanding a cream bun. 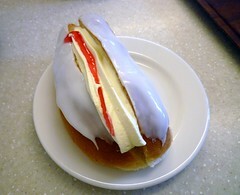 Ok, we got the cream bun and on Monday went into our solicitor's to sign paperwork and were excited again that, although delayed, we would be moving soon. Then on Tuesday we hear that not only does she want a cream bun, she is also demanding the moon on a stick and a Blue Peter competition badge. R and I discussed the issues and were agreed, that although not legal experts we were fairly sure that a Blue Peter competition badge was only slightly less impossible to obtain than the moon on a stick within the deadlines for our own purchase. Further conversations with various and numerous experts confirmed our fears and in fact, regardless of time and budget issues both a Blue Peter competition badge and the moon on a stick were logistically impossible and that the demands were "a wee bit silly". So, here we are having to get letters to confirm the silliness of demanding a Blue Peter competition badge and the moon on a stick, still surrounded by boxes, still not moved and still not sure when (I have banished 'if' because I refuse to believe this will fall through) we will get to move. Hang on in there. It WILL happen and will be well worth the wait. Damn annoying though, eh? !